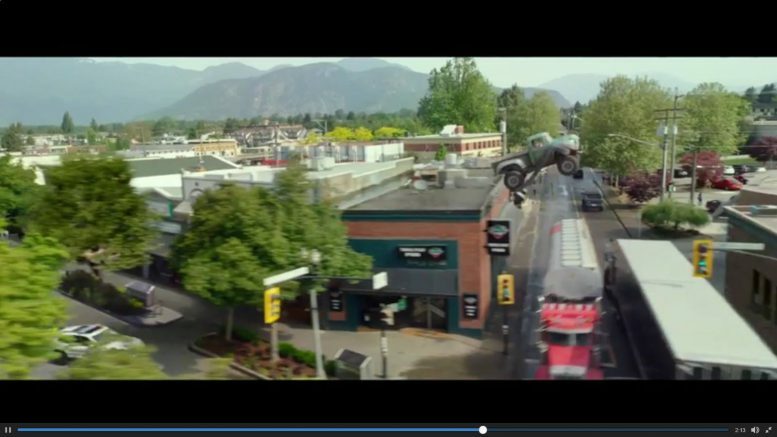 Chilliwack -DECEMBER 28 UPDATE – You may have noticed that the TV spots for the Chilliwack filmed “Monster Trucks” are sprouting up on the creen. One of the early shots is a clear shot of the transformed Five Corners. “Monster Trucks” is scheduled for a January 13 release. ORIGINAL STORY JUNE 3 – The Summer of 2014 will be remembered fondly by local movie buffs , when the film “Monster Trucks” took over Downtown Chilliwack . Cranes, cameras and guide wires were everywhere. The “circus” , also known as the film trucks, had taken over, and for the most part, we all enjoyed watching the making of a very expensive movie with plenty of special effects. Locals businesses were a little miffed at road closures but the City reeled in the money from various film permits. A return in 2015 for some pick up shots added to the anticipation. The film will hit theatres on January 13, 2017. It was directed by Ice Age director Chris Wedge. So the premise is: a high school senior Tripp (Lucas Till) built a monster truck from spare parts. He meets a friendly creature with a taste for speed, and you can guess the rest. The family friendly movie from Paramount Pictures was shot in RealD 3D, and it blends “cutting edge visual effects” with “state-of-the-art” computer animation work. Melding cutting edge visual effects and state-of-the-art CGI, Monster Trucks is an action filled adventure for the whole family that will keep you on the edge of your seat and ultimately touch your heart. January 2017 in theatres and RealD 3D. Be the first to comment on "Chilliwack Shot “Monster Trucks” Premiers January 13 (VIDEO)"